Storey Publishing, LLC, 9781580171076, 160pp. Make the most of your riding time. 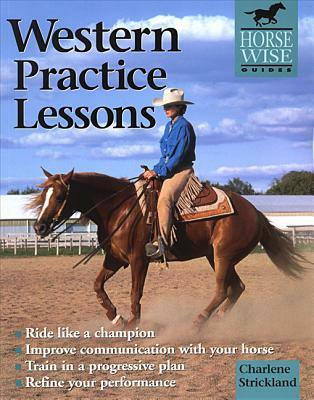 Charlene Strickland’s step-by-step lessons are full of tips, diagrams, and photographs that will help you achieve greater harmony with your horse as you refine your riding skills. Designed to help you efficiently perfect the fundamentals of Western riding — rhythm, relaxation and suppleness, readiness, engagement and impulsion, and straightness — you’ll learn to view each ride as an opportunity to improve the nuances of your horsemanship. Saddle up and start riding like a champion! Author of The Basics of Western Riding, Western Practice Lessons, and Competing in Western Shows & Events, equestrian journalist Charlene Strickland has published more than 600 articles on horse care, saddlery, dressage, jumping, eventing, vaulting, and similar topics. Her articles have appeared in The Chronicle of the Horse, Horse Show, The Horse, and Dressage. Strickland is a member of the U.S. Dressage Federation, the International Alliance of Equestrian Journalists, the Authors Guild, and the Society for Technical Communication. She has ridden and shown Western, hunt seat, and dressage. She is a senior technical editor with Science Applications International Corporation and lives with her husband, Geoff, in New Mexico.